The first thing to note in the production print business unit is that the new 60/70 pages per minute (PPM) color models launched in the third quarter of the previous year posted solid sales. In China, we exhibited at China Print, the second-largest such exhibition in the world, and won new orders in the Chinese market, which continues to expand. Overseas sales expanded, leading to higher revenue, due in part to demand in India ahead of revisions to the tax system. In marketing services, the unit was hit by constraints on marketing costs at major existing customer companies, and the provision of services to customers from which we had won new orders was delayed, resulting in lower revenue. On the other hand, performance at Kinko's was solid in both Japan and South Korea. Industrial printing grew significantly. Different skills and know-how to those needed for commercial printing are required to expand business conducted with customers in the industrial printing. 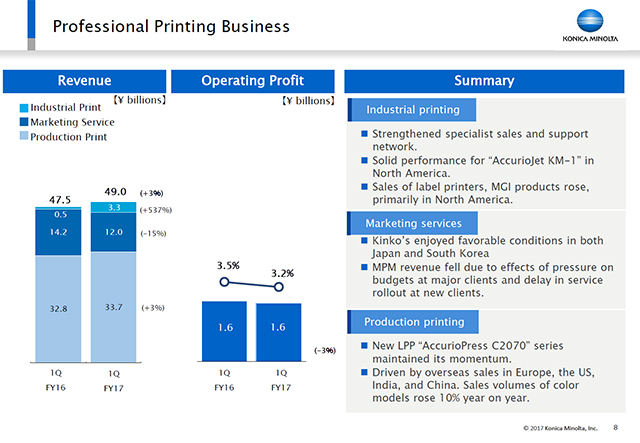 In North America, which was an early adopter of this specialist sales network for industrial printing, sales of the KM-1 and MGI products grew. We also reinforced this specialist sales network in Europe and in China in the first quarter. Operating profit was flat year on year, but in the second quarter we will work to strengthen profitability by expanding sales of the new 100 PPM color model launched in June and by growing industrial printing.